Located east of Old San Juan across Puente dos Hermanos the Condado neighborhood is home to many beachfront hotels, high-end boutiques, stately homes and high-rise condominiums. The life-blood of the Condado is Ashford Avenue; here you can shop stores like Cartier, Gucci, Dior or buy souvenirs at many of the small shops that dot the strip. Ashford Avenue is like strolling down some of the streets in Manhattan, NYC. When hunger strikes you can fulfill your culinary urges by choosing from traditional Puerto Rican food to international cuisine. In Condado you can find a restaurant to satisfy every taste. People watching is a must, tourist and locals alike come to enjoy this exciting partof the city soaking up the wonderful ambiance. On the last Sunday of every month a free outdoor Jazz Concert is held outdoors at La Ventana del Mar. Condado beach is relatively un-crowded with plenty of shade, a great place for romantic walks. 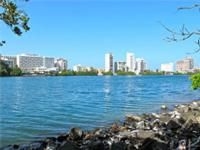 The Condado Lagoon located between Condado and Miramar offers paddle boats and paddle surfing on weekends. Ocean Park is located east of the Condado; a more residential neighborhood is home to many small inns each with its own unique ambiance. The golden sand beach at Ocean Park is a well-known hangout for young adults and really comes alive on weekends. The beach is great for people watching, playing paddle ball and Para-Surfing. This is a place to be seen so look your best as you strut your stuff on the beach. Often time's locals gather for impromptu jam sessions, playing the infectious beats and rhythms of salsa music. The long stretch of beautiful beach, hotels and high-rise condominiums, small guesthouses and restaurants that make up Isla Verde is actually part of the municipality of Carolina but part of the San Juan Metro Area. 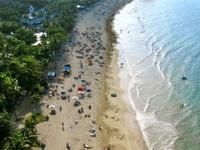 The beach at Isla Verde is a favorite sunning location for locals and tourist alike. Depending on the time of year it can get very crowded with sunbathers, water-sport enthusiast and people watchers. Morning and early evening is a great time to walk or jog taking in the refreshing breeze coming off the Atlantic Ocean. Excitement seekers can rent a jet ski, go parasailing, ride a banana boat or try their hand at paddle surfing. Isla Verde comes alive at night; there is no shortage of fine restaurants, local eateries, fast-food establishments, hotel casinos and souvenir shops to keep you entertained into the wee small hours.